“If alien astronomers are out there searching for signs of life on Earth, they might just find it in the telltale pattern of light reflected by our plants, from redwood forests to desert cacti to grass-covered plains. 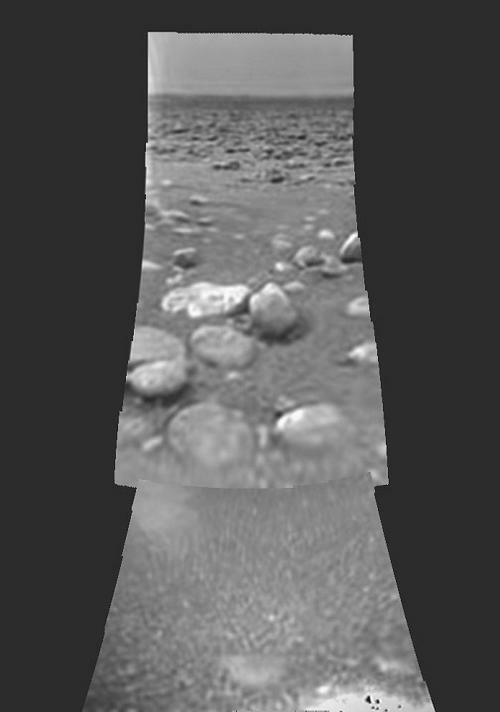 That reflected fingerprint has been visible since vegetation first began carpeting our rocky terrestrial landscape about half a billion years ago. And as Earth aged and evolution marched onward, the reflected signal strengthened. “Now, two astronomers are suggesting that plants could leave similar fingerprint-like patterns on distant exoplanets, and perhaps the first signs of life beyond our solar system could come from light reflected by forests covering an alien moon like Endor or cacti living in Tatooine’s deserts. “While this isn’t the first time scientists have suggested looking for life in a far-off planet’s light, Kaltenegger’s team adds a twist: Such reflections can also offer a good estimate for an alien planet’s evolutionary advancement, based on our knowledge of how things work on Earth. “Several decades ago, the Galileo spacecraft, which was headed for Jupiter, swiveled to stare at Earth’s reflected light. It spied the signs of biology at work in the presence of atmospheric gases such as ozone and methane. More recently, astronomers have teased apart Earthshine, or the bit of Earth-light that sometimes dimly illuminates the darker part of a crescent moon’s face. They found life’s fingerprints there, too. Text: “Want to Find Alien Life? Look at Older, Hotter Earths”, National Geographic. Image: L’occhio di Shui (The Eye of Shui) by Shui Mao. “Whereas all the planets, asteroids and meteors that originate within the solar system more or less circle what is called the Ecliptic plane, that of our sun, since they were formed from the same disc of gas and dust that rotated around itself, Oumuamua entered the solar system north of the plane, in an extreme hyperbolic orbit and at a speed of 26.3 kilometers per second faster relative to the motion of the sun. “A reconstruction of its trajectory shows that Oumuamua traversed the ecliptic plane on September 6, 2017, when the sun’s gravity accelerated the object to a velocity of 87.8 kilometers per second. On September 9, the object passed closer to the sun than the orbit of Mercury. And on October 14, five days before it was discovered in Hawaii, the object passed 24.18 million kilometers away from Earth, or 62 times the distance from here to the moon. “I wrote above that Oumuamua originated at Vega, but that’s not completely accurate: The universe is a vast place, and even at Oumuamua’s velocity – a velocity that no human spaceship has achieved – a voyage from Vega to the solar system would take 600,000 years. But in the meantime, Vega is orbiting the center of the Milky Way, like the sun and all the other stars, and it wasn’t in that region of the heavens 600,000 years ago. Text: “If True, This Could Be One of the Greatest Discoveries in Human History”, Haaretz. “In the hidden heart of science fiction had always been the hope that the moon and the planets promised some personal adventure akin to [a] sudden encounter with the Pacific – a transitory, enchanted moment when man, like Fitzgerald’s Dutchmen, would hold its breath before the fresh green beast of some radiant new world. At that moment, descending Christlike into time and space, the cosmos would become a place. This was the promise of [Chesley] Bonestell’s beaches – that those peaceful points of light in the night sky were places, that virgin rocks, asleep for a billion years, await my touch no less than the cup that sits before me, that there is a “transcendent mundaneness” abiding in parallel time and space, one that somehow merges the cosmic and the personal. Like the seashore, a Bonestell moonscape is a scared place at the edge of the known world – an altar set before the barrier, a piece of the mundane bathed in oceanic mystery. “We think of the boundaries of the known, the outer rim of our reality, as somehow harbouring the answers to our “Why” questions. Whether it be Aristotle’s geocentric spheres, Columbus’s ocean-sea, or our own space-time continuum, we conceive of this Larger Context as ultimately separate from an and alien to our everyday experience simply because it is assumed to mask the unknowable, the meaning of all meaning, as inaccessible to us as cosmology to an ant. To encounter the blue skies of Bonestell’s Titan, or to find that the reddish, rock-strewn desert of Mars looks like the American Southwest, suggests that the near edge of the Larger Context is a reality as familiar as my own backyard. Just as the beach is perceived as the edge of infinity out of the abstract and into the realm of direct experience. Text: Wyn Wachhorst. 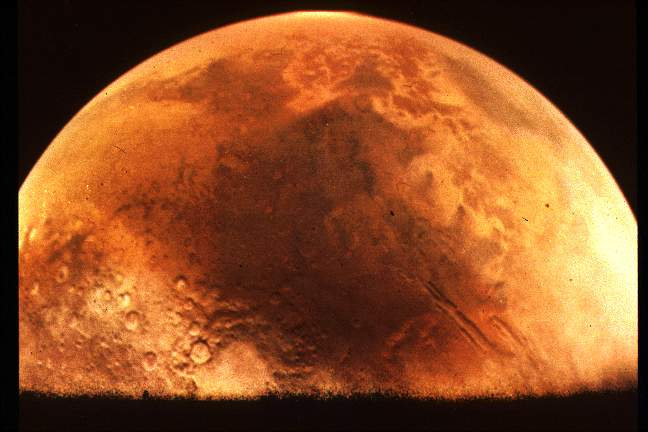 “The Dream of Spaceflight: Nostalgia for a Bygone Future”, The Massachusetts Review, Vol. 36, No. 1 (Spring, 1995), pp. 7-32. 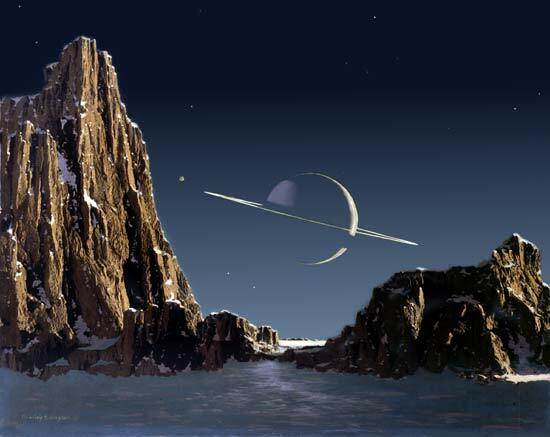 Image Top: Saturn as seen from Titan, painting by Chesley Bonestell, 1944.